Collins Booksellers - Budget Weddings For Dummies by Meg Schneider, 9780470567500. Buy this book online. Don’t let ‘white blindness’ drive you into debt! Make your wedding everything you want it to be on the budget you determine. Are you planning a wedding, but worried about how much money you'll have to spend? 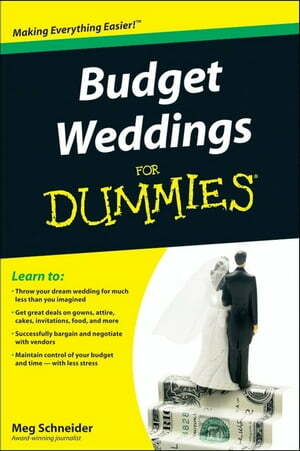 In today's tough economic times, planning a budget wedding is more important than ever. This fun, money-saving guide is packed with tips for planning the wedding of your dreams without breaking your bank account! Inside you'll find tons of tips and advice for planning a budget-friendly celebration while still remaining true to your personality, values, and tastes. You'll see how to make and keep your wedding budget; select the most economical time to get married; scope out wedding locations that fit the bill; and incorporate everything from economical to green ideas that emphasize style and elegance. Plus, you get tips and pointers for negotiating with vendors and avoiding hidden expenses and add-ons. You don't have to settle for less on your wedding day. Author, Meg Schneider is an award-winning journalist who planned her own wedding for less than $5,000 Budget Weddings For Dummies is the only guide you need to save yourself money, time, and stress while you plan a beautiful, memorable ceremony!